One of the most dazzling meteor showers of the year will be lighting up the sky next week, weather permitting. Five 'supermassive' black holes that were previously hidden by dust and gas have been uncovered by astronomers at the University of Durham. Star gazers were treated to an astronomical spectacle over the weekend as the comet PanSTARRS was in good view over the region's skies. Amateur astronomers are being invited to a stargazing event at St Mary's Lighthouse, in Whitley Bay tonight. North Tyneside Council and South Tyneside Astronomical Society are hosting the autumn sky watching night on October 13. It's hoped people will see Jupiter rising and the Andromeda Galaxy through powerful telescopes. The free event starts at 6.30pm and runs until 11pm. All children must be accompanied by an adult. Police say they have received UFO sightings in the skies over the North East. But the mysterious lights have been attributed to meteors. Durham Police say they have received numerous calls from the public about mysterious lights in the sky. 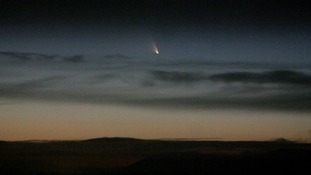 The calls came in at about 11pm last night but have been attributed to meteors rather extra terrestrial visitors.